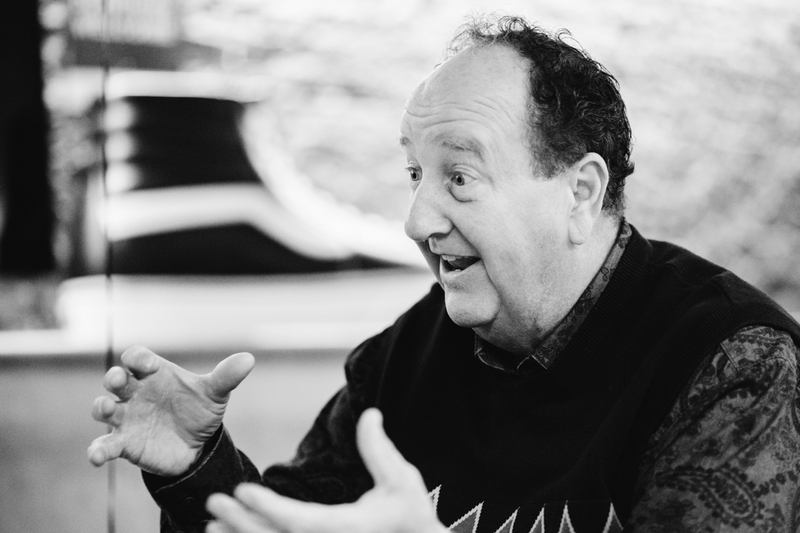 For our interview with Steve Van Doren we decided to team up with Henry Davies from The Other Side of the Pillow. For those that don’t know, Henry is an avid Vans collector and runs a vintage Vans shop in east London, which is essentially like a Vans museum. 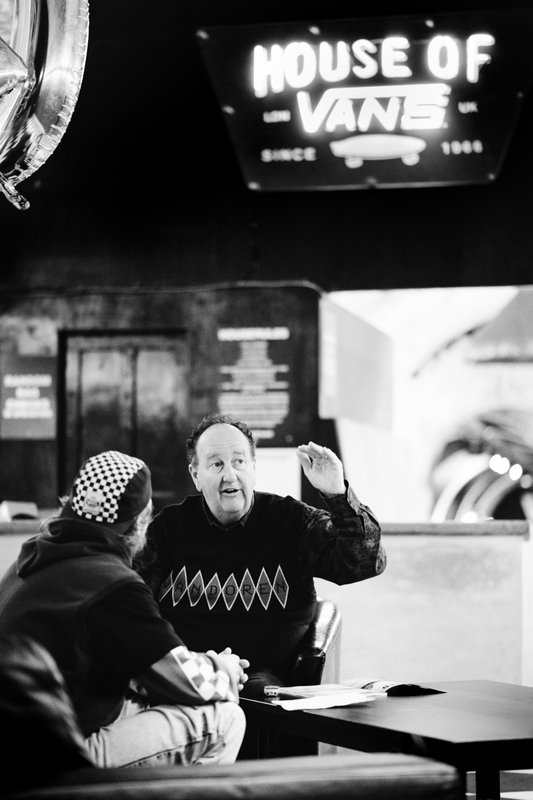 Van Doren already knew Henry and actually asked him to create Vans historic displays from his collection for House of Vans in London and New York for Vans’ 50th anniversary. 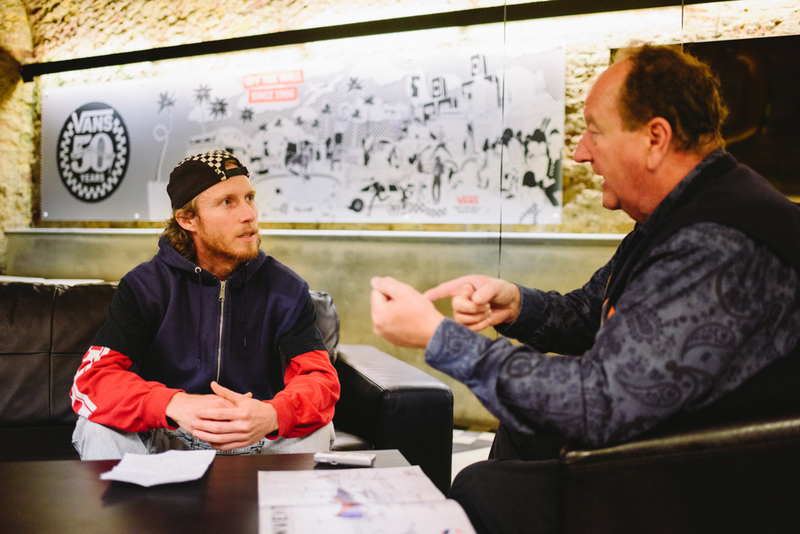 So we thought it would be good to get these two Vans aficionados together for a chat… Heck, why not? The classic perception of the (Vans) brand is as a skateboarding brand and in (my shop in) the UK that’s the general perception people have… But of course, the first ten years of the brand were pre-skateboarding. 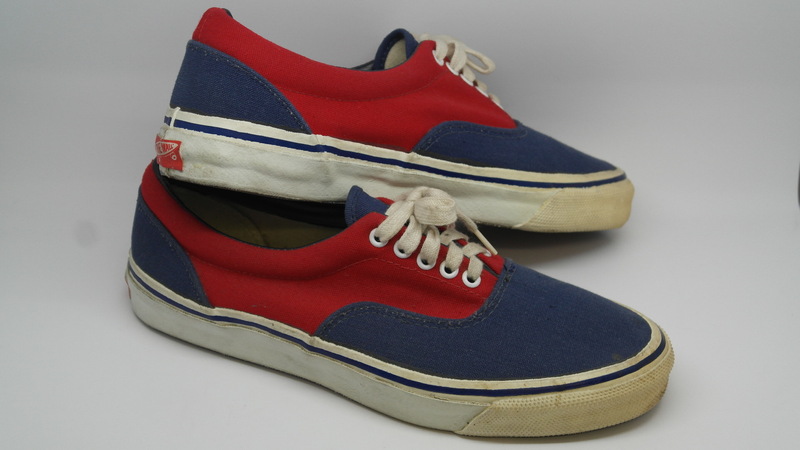 Steve Van Doren: Yes we were just trying to find a customer that could get a pair of shoes and when my dad and (uncle) Jimmy made Vans they made the sole twice as thick as the other brands and they used the strongest canvas and nylon thread. They had to make them the strongest as we didn’t advertise, so we had to just win people over…. and that formula with the grippy sole is what skaters liked. So skaters bought the shoe, because they knew it would last three or four months while others would only last a week or two. Yeah well my dad did a store and he did four displays. He did one with a ladies’ style fabric, he did a boat shoe with a nautical scene that had the non-slip blue bottom and over here he had a basketball one with styles 23, 24 and 31 and 32 (basketball high & lows). That’s what was around in those days, we didn’t know about skateboarding at first. Yeah you’ve seen pictures of my dad before he started Vans there in Huntington Beach and that’s where he got his ideas of custom made shoes and his own shoes. He tried to talk to the guys at Randy’s (Randolph Rubber Company) about manufacturing, but they wouldn’t listen, so he left and went on his own. I remember in ’74 these guys were up in our stores in Santa Monica, so Lois or Fern from Redondo Beach would call up…. and we’d say ‘ok, give them some shoes…’ That was in 1974. The Era (style 95) came out in ’76 where we basically padded out the heel, but we kept the same formula for everything. And then from there, as we were supporting them and they were going through shoes quicker because they were skaters tearing them up we decided to come up with the Old Skool, style 36. So this had some more leather pieces on it and quickly they wanted the mid-top so style 37 (Mid Skool) came around. 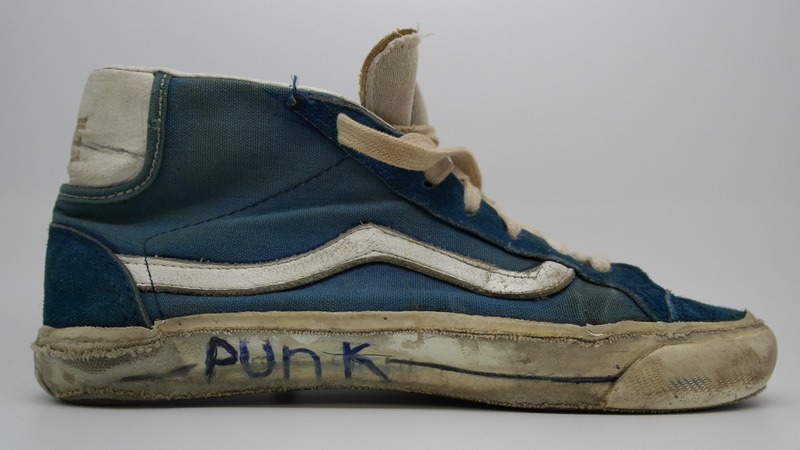 Then we had an ankle guard, but that started to get a little funky for them so we decided to take that material and make the Sk8-Hi. That was before we did the mid. And then the mid came out the same time and we got rid of the ankle guard and the mid and then we did the Sk8-Hi. Yeah they did something with two different coloured bottoms. At that 1964 contest they were skating barefoot doing slalom through cones. So whenever my dad left Randy’s, they tried to come up with some shoes. Unfortunately for them, but fortunately for my dad, in about three years from then they went out of business. They were the third largest shoe company in the United States. Do you think subconsciously that Randy shoe influenced what happened later for you guys? It was back in the early sixties so Hobie was around and other things there… It was really Tony (Alva) and the Dogtown boys that put it on the map. They went down to Del Mar, and it was a certain type of skating, and all of a sudden the Dogtown boys came in and it was Tony and Jay Adams and it was way different. They were gnarly. The interesting thing to me is that the skaters adopted your shoes and it wasn’t the other way around where you guys marketed the shoes to skateboarders. No, not at all. And that’s why 50 years later, they adopted us in the beginning and I’ve adopted them for a lifetime. Yeah Fast Times at Ridgemont High, we’re lucky. So we made rubber that had checkerboard on it, but we made shoes afterward with that on it and Sean (Penn) went into the Santa Monica store and got a pair. And after that Universal called up our PR lady Betty Mitchell and Betty got a couple dozen pairs down to the set and you know, it happened. Absolutely! So the first ten years with pre-skateboarding…. can you imagine Vans without skateboarding? I’d still be passing out flyers man! We didn’t know any better; we were just trying to get customers; anything we could to get people to know our brand… On the East Coast they called them ‘sneakers’; in California they called them ‘tennis shoes’ so that’s why some of the old signs you see say ‘Vans tennis shoes’. 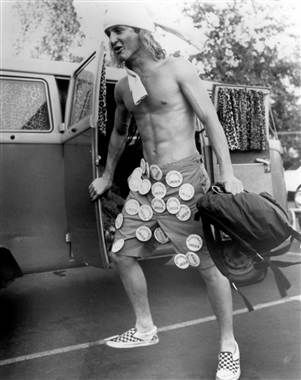 But remember Jeff Spicoli was a surfer, and probably a skater too. Yes and Sean Penn’s a surfer. Does he (Sean Penn) not have links with the original Dogtown crew? I don’t think so. In the movie he’s a surfer dude skater dude though. Yeah we weren’t marketing buffs. Despite ourselves, we were just trying to grow our business. And the skaters stuck with us because it (Vans) just performed better. From ‘76 to ’84 I was in charge of half of the stores. And so we would let our managers decide on 10 styles/colours for their store. If in the area there were high schools with the colours green and white, red and white, gold and blue, whatever it was, then we’d let them have those shoes. If they saw a trend in their area, we let the managers have 10 custom shoes. And eventually if we had 40 of the 60 stores stocking blue and gold, then we’d make that a new stock shoe for all the stores. For other brands it’s hard when you work seasons ahead. Yeah now today we’ve already got our work done for 2017. A funny story if you wanna hear one: back in the eighties, when checkerboard came out, as soon as we came out with the red and white checkerboard I would see (competitors) Kinney’s, Tom McCan, big chains, a thousand stores each, with similar checkerboard shoes three months later. They’d make them in China. They’d come over to our store and see them. We only had one mall store back then in 1980, the West Covina Fashion Plaza Mall. Then we came out with navy blue and light blue Vans and they’d have a copy of that in their stores three months later. So one time, green never sold, so I made 20 pairs of green and white Vans and put them on display in that store. They came, saw it, copied it, and three months later it was at all there stores and it was a dud because it doesn’t sell! We had to sue them in the courts on the checkerboard, and we won. We’ve probably done a couple suits: one was checkerboard, because everyone copied it and there was one with the sole. So with the sole, my dad went to Supreme Court on the East Coast because they were telling us that we couldn’t trademark our sole because it was functional. So my dad brought a grey rubber shoe with a waffle design and he brought the sole of our brown crepe. So the female judge took the Vans shoe with the crepe sole we brought her and put it down on her bench with her hands and pushed with force. It didn’t move. Then she took the one with the hard rubber grey sole and put it down on her desk and pushed and she fell across her bench. It slid. It’s not the design; it’s the rubber. So we proved that and trademarked the rubber on our sole. So we can admit that Vans would never be the same without skateboarding. Do you think skateboarding would be the same without Vans? I feel everything we’ve always done… We did ten years of Vans Triple Crowns, we did Slam City Jam for ten years in Vancouver, we’ve done the Vans pool party for 12 years, Bondi for 11 years and we are now starting the park series that’s going around the world to five countries starting off in Australia in April, Brazil in May, July in Canada and the USA and then over to Malmö, Sweden for the world championships, but we’ve been doing so many things in skateboarding. Twenty-two years ago we had the Warp Tour for seventeen years and we had vert contests, street contests, amateur skating for girls, amateur skating for guys, all the people that do skateboarding we’ve always supported. We’ve done a lot and I don’t think skateboarding would be the same without us. We spent 30 million dollars putting nine Vans parks around the country. And then we closed eight of them because the malls, after 2-3 years they wanted to triple our rent. When we first started doing that around the country there weren’t many skateparks, but then the laws passed so that you couldn’t get sued if you fell and got hurt at a skatepark. The laws changed right after we put those parks in and then there hundreds of parks that popped up around the country. So it suddenly wasn’t as important to have those Vans skateparks so we closed them down and he we had to write off like 20 million dollars. But we were at the forefront of doing that, of getting cement parks back. Your contribution to skateboarding has been immeasurable, but I would argue that you (personally) contributed more fun to the scene. Yeah the Off the Wall playfulness is still there. Another thing with skating is that there’s so many different ways that we’ve tried to help out. 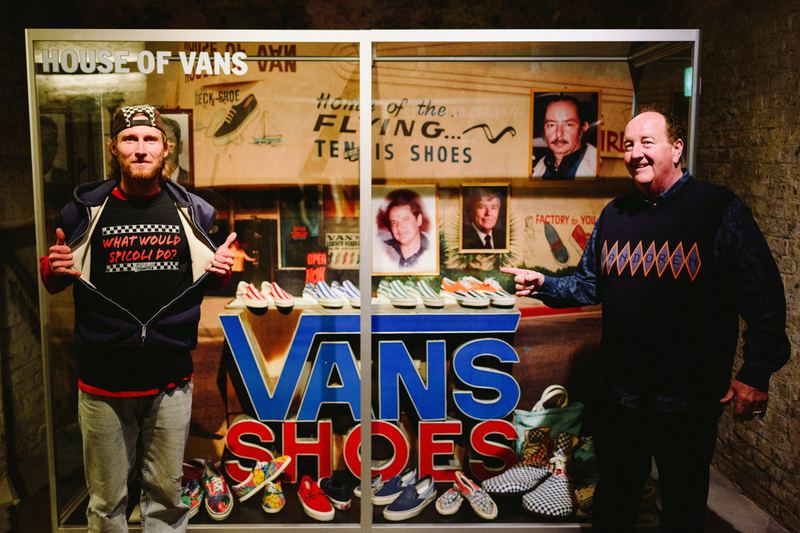 In our 400 Vans stores in the US, about 250 of them skate shops in them. We sell everybody’s boards, wheels and trucks so we support the industry all the time through our stores. And obviously the life of skateboarding historically is cyclical; it’s up and down, so you guys have had to deal with this. Skateboarding has always been like this. It did it in the seventies, the eighties, in the nineties and so on. It’s always ups and downs but we keep supporting it every year. We don’t want to abandon it. We had to unfortunately stop giving out free shoes from ’84 to ’87, so my manager Everett Rosecrans that we hired in ’77 I had to let him go in ’84 for three years. As soon as we got out of Chapter 11 the first thing I asked the new company to do was hire him back. And they did. But that’s why in the mid-eighties Vision Street Wear was able to come in to skateboarding, because Everett wasn’t there for us. And we need to give a shout to BMX during those years, because when skateboarding was in its decline you guys owned BMX. Yes Everett was big BMX proponent. He’s the one that put that on the map. 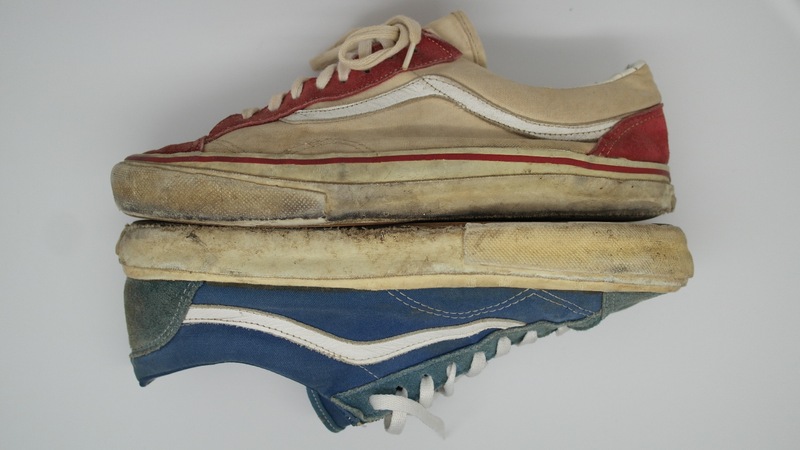 This was a question that I was asked recently: people are passionate about other brands, other shoe companies, whatever… Why does Vans create an emotional connection through their shoes more than other brands? My dad is 85, but he picks up on it quick. He says: ‘You know, when somebody gets a pair of Vans they feel like they are part of the family.’ They might be part of the family that loves art, they might be part of the family because they like skateboarding, they might be part of the family because they like music, but they feel like they connect and are part of the family. And they just stay loyal. I agree. And other brands might be linked to sports, but BMX and skateboarding are arguably not sports, it’s a cultural thing and they buy into the family and tap into the culture. Yeah they might be 50 and have a son or daughter that’s 30 or 25, and have a grandson or granddaughter that’s aged 3, and somehow Vans is fine, it’s cool for three generations. A lot of times kids are all: ‘I don’t wanna be like my parents,’ but if it’s a parent of a skater and if they used to do the same thing and that’s how they connect with them then that’s great. People talk about the Van Doren spirit, which I’m a firm believer in. I’ve heard a small interview with your dad about this and he admits more than anything that you and your personality embody the spirit of Vans. How does that make you feel? You know the way I grew up… I never drank because I always knew I had to work the next day. I watched my brother-in-law and everybody else party and I’d drive them home, but I was always responsible. And having a daughter and her growing up and her friends and stuff, I live through what they are doing. At Vans it’s the same thing travelling with the legends and stuff; I’m just honoured that all these people enjoy what my dad started. And my whole life I’ve always tried to never let him or myself down by screwing up. I might have a good food fight every now and then, but nobody got hurt. But just, I set an example and my daughter is the same way I am and my nephew and niece that work at Vans and all my crew. We don’t go to an event and just sit; we’re going to get involved. I just got done doing New York a day and a half ago and I made 1200 sliders that day, Mike made 600 waffles and we had 350 pizzas, but I got to talk to everybody. I got to talk to 1200 people. If I’m a sourpuss, I’m gonna show sourpuss. If I’m a happy guy and I appreciate what my dad started and my uncle and Gordy and stuff then that’s the way I am. I’m just an optimistic person. My grandfather on my mother’s side was full blood Scottish and he was always happy; he went to church every day and he was a blacksmith. He shoed horses; he worked hard. The Van Doren spirit is just if you like what you do, then you don’t have to work a day in your life. I feel the same way. I feel blessed to be part of this brand…. to make a living doing what I’m doing. Yes that’s my kind of philosophy of it. And it’s almost like you were destined to play this role from an early age. The honour is all mine and in my opinion you personify the integrity, the playfulness and the personality of Vans and I thank you for shaping the course of the brand and the course of millions of lives around the world. Thank you very much. It’s my pleasure.